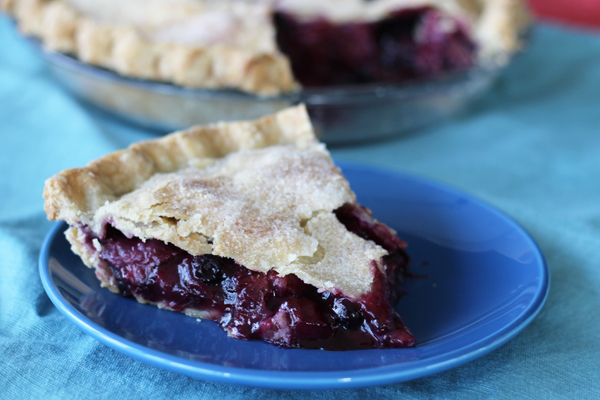 This Mixed Fruit Pie earned its maker the “best overall pie” honor at last year’s Minnesota State Fair (2014). The judges, a panel of food science professionals, chose the top pie based on appearance/color, texture/internal appearance, and flavor/aroma. In other words, it is all about execution…as in a perfect pie performance. Fancy that! Fay Peterson did it best with this Blueberry Rhubarb Strawberry Pie. Many people are intimidated by home-made pie crusts. Give this one a try. We found it forgiving and, more importantly, delicious. You can make the crust ahead and refrigerate or even freeze it. Just bring it back to room temperature before rolling it out. Note: the pie crust recipe is for three crusts, so you will have one extra to make a cream pie, meringue, or some other one-crust pie. You can never have too much pie around, right?! Using fresh blueberries, rhubarb, and strawberries is best, but if that’s not an option, thaw and drain frozen fruits, using the same portions: 2 cups blueberries and 3/4 cup each rhubarb and strawberries. Tune back for more winning pies this summer and fall. In large bowl, combine flour, salt, and sugar. Using a pastry blender, cut in shortening until the mixture is crumbly or crumbs are the size of a pea. In a two-cup glass measuring cup (or bowl), beat egg, vinegar, and cold water. Slowly add to flour mixture, tossing and stirring with a fork until liquid is absorbed, being careful not to over-mix. Divide dough in thirds and form each into a disk. Freeze or refrigerate one for later use. Roll out one portion on lightly floured surface into a circle large enough to fill a 9-inch pie plate (stoneware or glass are Fay’s preferences) with an 1/4-inch overhang (so about 12-inches). Press into plate, leaving extra crust around the edges. In medium bowl, mix sugar, flour, vanilla, cinnamon, and salt; set aside. In large bowl, combine blueberries, rhubarb, and strawberries. Add the sugar mixture to the berries and gently toss to combine. Place in prepared bottom crust. Add pats of butter on top. Roll out second pie crust into a circle large enough to fit as a top crust with overhang (about 11 inches) and place on top of filling. Tuck top edges under bottom crust edges and crimp. Cut air vents on top. Sprinkle sugar on top. Bake at 350 degrees F for 1 hour, or until bubbling. Keep an eye on oven and cover edges if needed to prevent overbrowning. 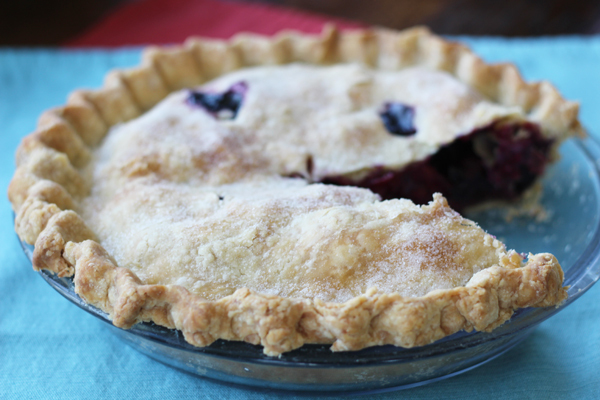 Let pie completely cool before slicing and serving.